We are interested in hearing about brand licensing ideas that provide an opportunity to extend our brands to products and services that are aligned with our core values and the brand's targeted consumers. Entrepreneurship has become a dominant and powerful ideology reaching communities across all borders and languages. Individuals everywhere are eagerly standing up to identify themselves as entrepreneurs, whether they own a business or not. That's because the hallmark characteristics of this movement and the Entrepreneur® brand embody innovative thinking, passionate living and leadership, and most importantly, the desire to achieve personal excellence with every pursuit. The Entrepreneur® brand has cultivated and inspired this way of life for decades. 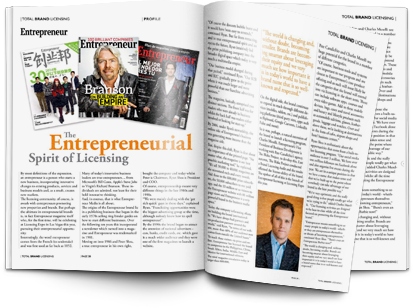 Now, through licensing, the trust and dedication held by the Entrepreneur® name can be extended to those products and services closely aligned with the most sought after lifestyle in the world. We will review requests that we believe fit with our brands and businesses. If we are interested in your request, we will forward a licensee application for you to complete within 14 days. This will provide us with more information about your company and proposal. At this time, we will also provide you with an Entrepreneur Media point of contact to further discuss your interest. If you are interested in brand licensing opportunities, we ask that you complete our form below. By submitting this information, you agree that we may contact you about this and other topics via e-mail, phone, fax or mail. You may opt out of our contact database at any time.